Vanadium - 23V Your user agent does not support the HTML5 Audio element. 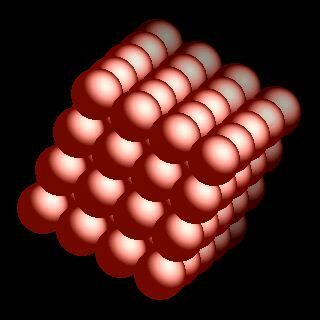 Vanadium atoms have 23 electrons and the shell structure is 2.8.11.2. The ground state electronic configuration of neutral vanadium is [Ar].3d3.4s2 and the term symbol of vanadium is 4F3/2. Vanadium: description Your user agent does not support the HTML5 Audio element. The solid state structure of vanadium is: bcc (body-centred cubic). Vanadium is essential to sea squirts (ascidians). The concentration of vanadium in sea squirts is a million times higher than in sea water as a consequence of their ability to concentrate vanadium. Vanadium is a necessary part of the diet of rats and chicks, but only is very small amounts. Deficiencies cause reduced growth and impair reproduction. Reactions of vanadium as the element with air, water, halogens, acids, and bases where known. Binary compounds with halogens (known as halides), oxygen (known as oxides), hydrogen (known as hydrides), and other compounds of vanadium where known. Bond strengths; lattice energies of vanadium halides, hydrides, oxides (where known); and reduction potentials where known. Vanadium was discovered by Andres Manuel del Rio and Nils Sefström in 1801 at Mexico and Sweden. Origin of name: named after "Vanadis", the goddess of beauty in Scandinavian mythology. 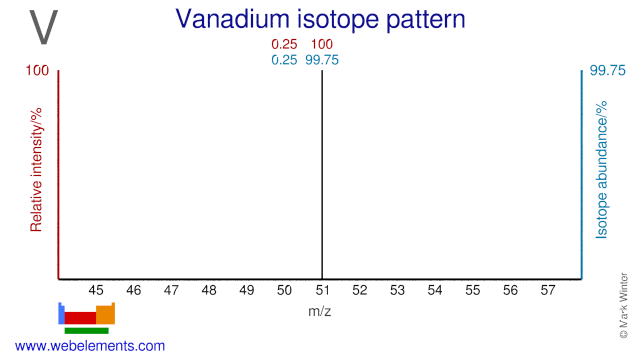 Isotope abundances of vanadium with the most intense signal set to 100%. 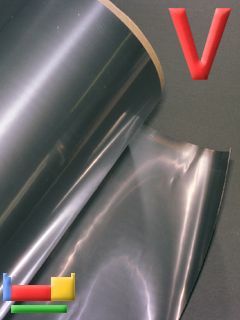 Vanadium has two isotopes and one of them, V-50, has a very low natural abundance (0.25%). V-50 is occasionally used for research purposes. V-51 is used in diabetes and metabolism studies.